From the New York Times bestselling author of Bad Feminist: a searingly honest memoir of food, weight, self-image, and learning how to feed your hunger while taking care of yourself. "I ate and ate and ate in the hopes that if I made myself big, my body would be safe. I buried the girl I was because she ran into all kinds of trouble. I tried to erase every memory of her, but she is still there, somewhere. . . . I was trapped in my body, one that I barely recognized or understood, but at least I was safe." 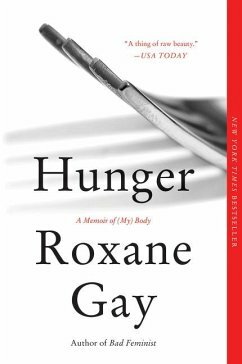 In her phenomenally popular essays and long-running Tumblr blog, Roxane Gay has written with intimacy and sensitivity about food and body, using her own emotional and psychological struggles as a means of exploring our shared anxieties over pleasure, consumption, appearance, and health. As a woman who describes her own body as "wildly undisciplined," Roxane understands the tension between desire and denial, between self-comfort and self-care. In Hunger, she explores her past-including the devastating act of violence that acted as a turning point in her young life-and brings readers along on her journey to understand and ultimately save herself. With the bracing candor, vulnerability, and power that have made her one of the most admired writers of her generation, Roxane explores what it means to learn to take care of yourself: how to feed your hungers for delicious and satisfying food, a smaller and safer body, and a body that can love and be loved-in a time when the bigger you are, the smaller your world becomes.